Pope Francis named the first African-American to the Catholic Church’s most senior United States position yesterday, seeking to end a period of upheaval in a job whose previous two occupants were caught in sexual abuse scandals. 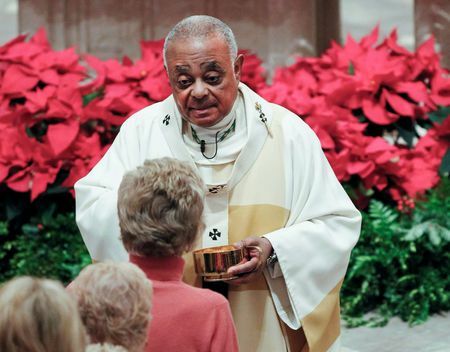 Former Atlanta Archbishop Wilton Gregory, 71, was made the new head of the Church in the U.S. capital Washington, D.C., and is also likely to become a cardinal eligible to vote in a conclave to elect the next pope after Francis. He would be the first African-American to hold the rank of cardinal too. The U.S. embassy to the Vatican noted that Gregory’s appointment coincided with the 51st anniversary of the assassination of black rights leader Martin Luther King Jr.
Gregory, who converted to Catholicism as a teenager, is considered a progressive who prefers dialogue and has largely shunned the U.S. Church’s often strident culture wars over issues such as abortion and homosexuality. Gregory’s immediate predecessor, Cardinal Donald Wuerl, resigned last October after 12 years in the job following a grand jury report that criticized him for failing to halt abuse in his previous role as archbishop of Pittsburgh. Wuerl succeeded former Cardinal Theodore McCarrick, who was expelled from the priesthood earlier this year after being found guilty of sexual crimes against minors and adults. The diocese was rocked by the back-to-back scandals and had been without an official leader for six months.